A brilliant first-half goal from Philippe Coutinho was negated by Steven Zuber's controversial header as Brazil kicked off their 2018 World Cup campaign with a disappointing 1-1 draw against Switzerland. RIO DE JANEIRO, BRAZIL – After a four-year wait, tournament favorites Brazil began their 2018 World Cup campaign in disappointing fashion yesterday (June 17th) as the Seleção drew 1-1 with Switzerland in a physical match at Rostov-On-Don in Russia. 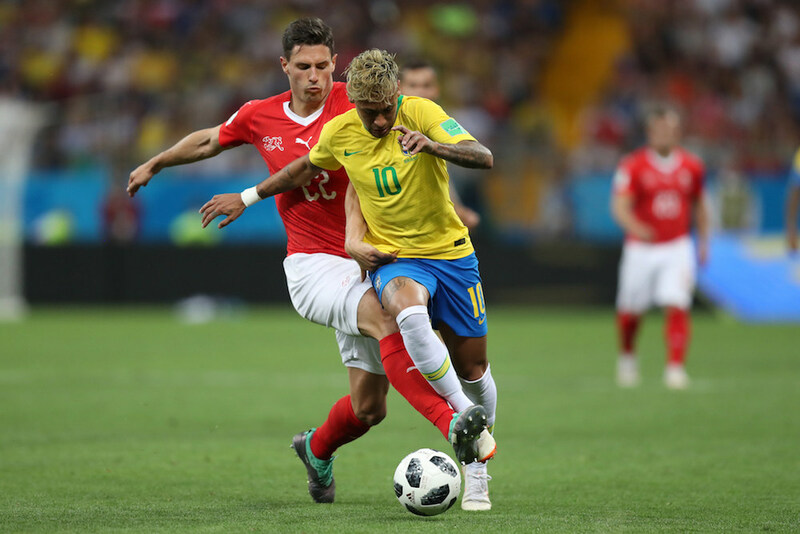 Brazil were held to a 1-1 draw by Switzerland in their 2018 World Cup debut, photo courtesy of the CBF. Brazil entered the tournament in search of redemption after the club’s embarrassing 7-1 loss to Germany on home soil in the semifinals of the 2014 World Cup. For the 2018 World Cup, the club finds itself as one of the oddsmakers clear favorites having lost only once in 21 matches while giving up a total of five goals in the process. Despite the fanfare surrounding Brazil, Switzerland started yesterday’s match suprisingly strong, garnering the games’ first shot on goal. But, Brazil’s perennial talent soon came to the fore as the seleção upped the tempo on offense and soon appeared to be overwhelming the Swiss defense. At the 20-minute mark, Brazil broke through. Coutinho found himself with the ball outside the goal area and let loose a brilliant bender from 85-feet out that curled just past the diving Swiss keeper Yann Sommer for the game’s first goal. Despite Brazil’s constant pressure throughout the period, Switzerland maintained its composure keeping the score 1-0 at the half. Turning point of the game came five minutes into the second half when, off the corner kick, Switzerland’s Steven Zuber nodded home the equalizer from close range to make the game 1-1. Brazil appealed to the officials to call a foul or at least do a video review (Video Assistant Referee system or V.A.R.) of Zuber’s goal, complaining that he pushed the defender Miranda in the back before the header, but the officials let the goal stand without a V.A.R. review. Throughout the remainder of the match, the seleção had numerous scoring chances but could not capitalize. In the game’s closing minutes, it appeared as if Brazil would finally put the game away, with Neymar earning free kicks on two separate occasions. But, Switzerland defended both free kicks and survived Brazil’s closing flurry to pull out the 1-1 draw. Neymar was marked throughout the match, fouled 10 times, the most for any player in 20 years, photo courtesy of the CBF. The draw marks the first time Brazil has failed to win their opening World Cup match in forty years. “Of course my expectation was victory. I’m not happy with the result,” said Brazil head coach Tite after the game. 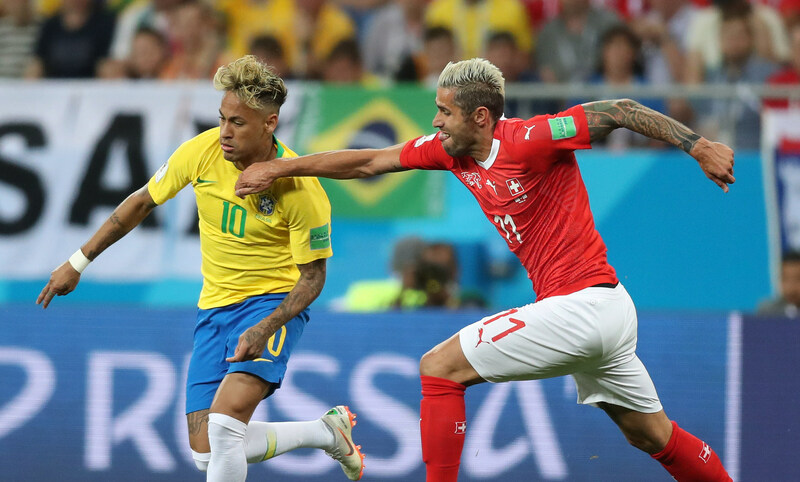 Notably, Switzerland played a brusing match against Neymar, fouling the superstar ten times, the most for any player in a World Cup match since 1998. Following the match, Neymar was seen limping off the pitch but speaking with reporters afterwards, the superstar reassured fans that he was fine. “It was a normal blow, nothing worrisome,” said Neymar. The Seleção will look to rebound next Friday, June 22nd, when they take on Costa Rica in St. Petersburg.